Forecast has it that this week will be entirely rainy and muggy outside. Bummer. 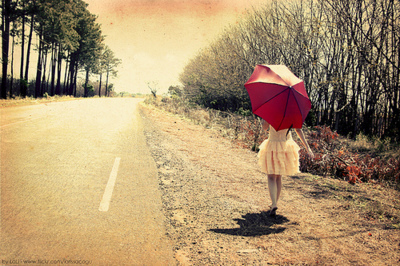 Nonetheless, there's something so appealing about walking down a road with a bold red umbrella wearing a frilly cream-colored dress. These photos captivate me in every way possible and I have definitely convinced myself that a red umbrella is quite needed on my must-buy list. I am planning on taking full advantage and most likely spending my time indoors because there is nothing I can possibly do about this dreadful weather. I plan on dividing my time between finally reading / finishing up my favorite books and searching for new places online to visit on my trip to New York City near the end of next month. 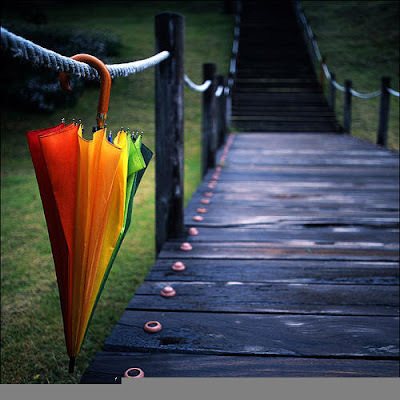 How do you spend your rainy days? Do share, I'd love to read about them in the comments! this is such a cute post. 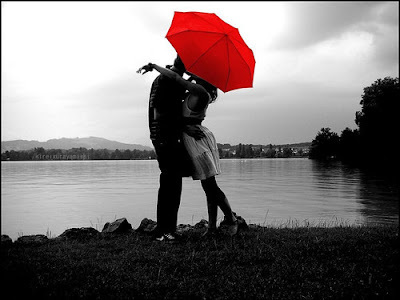 I think bright umbrellas are SO fun (sorry it's raining in the summer there) I really like the bright red pic with the people kissing. I was also wondering if you could vote for me?